Fay Presto is available for both corporate and private events. Equally at home performing for a few people in the intimate settings of a dinner party, or at a large corporate function, Fay is guaranteed to lift any event and provide the perfect ice-breaker. Fay is available for private dinner parties, corporate functions, wrap parties, weddings, exhibitions and conferences, product launches and much more. Fay's stand-up show has seen several years at the Edinburgh Fringe Festival, in theatres all over Britain and as far away as The Magic Castle in Los Angeles. 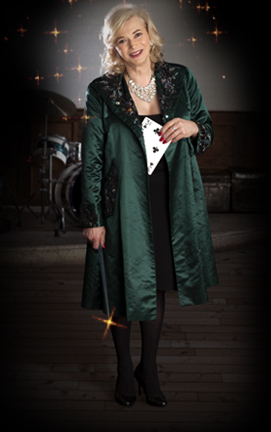 She also fronts her own magical variety show 'The Presto Pack' featuring herself, the physical and acrobatic magic of Fluke, and the whole new twist on silent magic put together by Richard McDougall all accompanied by top pianist, The Amazing Harry (as seen on Channel 4's The Big Breakfast).